We leave from Inuvik, which is in Northwest Territories, but we cross over the line into the Yukon pretty quickly. We ride down to Dawson City (450 miles on a dirt road with very little services). From Dawson City we go to Whitehorse, then do a little loop to Haines and Skagway in Alaska, then to the south. 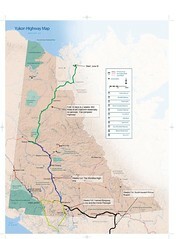 You might like the wonderful flash animations on http://www.experienceyukon.ca/, with the "interactive map".